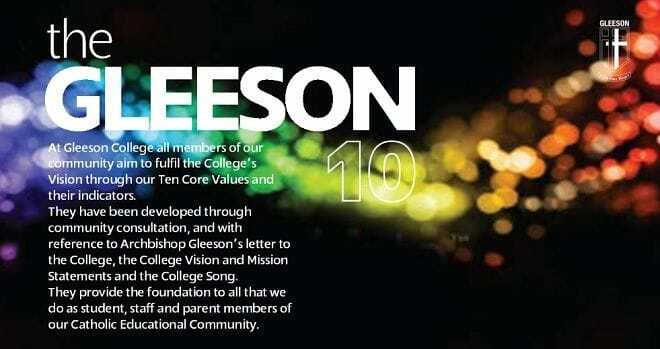 At Gleeson College all members of our community aim to fulfill the College's Vision through our Ten Core Values and their indicators. They have been developed through community consultation, and with reference to Archbishop Gleeson's letter to the College, the college Vision and Mission statements and the College Song. They provide the foundation to all that we do as student, staff and parent members of our Catholic Educational Community. Care for all members of the community. Listen actively to members of our community. Show empathy with and for others. Value the well-being of others and ourselves. Welcome new members and visitors to the College. Contribute to a supportive environment. Participate positively in College outreach activities. Participate in the broader life of the College. Provide for the education for the whole person. Develop independent, articulate, skilled and engaged learners. Challenge ourselves to make the most of learning opportunities. Accept personal responsibility for quality learning in a changing world context. Create an environment of encouragement, persistence and best effort. Seek innovative and evidence-based learning opportunities. Seek opportunities for the attainment of quality through continuous improvement. Evaluate self-assess and reflect on all that we do. Promote a culture of acceptance and inclusivity. Respect and embrace other faiths and beliefs. Support community service and social justice activities. Provide processes of reconciliation and restorative justice to resolve differences. Promote an environment of trust and respect. Respect the built and the natural environment. Respect our property and the property of others. Demonstrate pride in the achievements of our College. Represent the school with honour. Celebrate the individual accomplishments of staff and students. Acknowledge the contributions of groups or individuals to the success of the College. Seek truth in all we do. Value the perspectives of others. Act with integrity in dealings with others. Be faithful to the core social teachings of the Catholic Church. Value the College and its community as a place of peace and harmony. Uphold the College as a place of safety. Work collaboratively for the benefit of all community members. Actively appreciate the skills and contributions of all community members. Promote the love of God, the example of Jesus and the ethos of Archbishop James Gleeson. Appreciate God's creation and its meaning in our lives. Support the identity and mission of the Catholic Church. Nurture the Spiritual/Faith Journeys of Community members.